A legjobb budapesti program, amin eddig voltam! Vacsora, élő műsor és hajózás… olyan összhangban volt minden, hogy csak ámultunk. A férjemmel imádtuk! Külön gratuláció a szuper kedves személyzetnek! Wir haben diese Dinner Cruise wirklich genossen, wir wollen wieder kommen. Danke Silverline, die Ente war fantastisch. J’ai toujours rêvé de voyager à Budapest. Nous avons passé 4 nuits, c’était vraiment incroyable pour moi. La Hongrie est belle, les gens sont très amicaux. La nuit dernière, nous sommes allés célébrer mon anniversaire à Dinner Cruise par Silverline. Ils ont chanté une chanson pour moi, j’ai un gâteau gratuit. Merci le personnel de Silverline. A párommal vettem részt a vacsorás zongoraesten. Fantasztikus élménnyel lettünk gazdagabbak. Kedves felszolgálók, kiváló ételek és színvonalas műsor, no meg az a gyönyörű panoráma! Fantasztikus élmény volt!!! Az ételek kifogástalanok, a műsor színvonalas, és a kivilágított Budapest egyszerűen gyönyörű. Nincs hozzá fogható! Had an excellent night on the Silverline dinner cruise. The staff were very friendly, the food fantastic. We chose the unlimited drinks offer and were not disappointed, as soon as your drink was low they bought you another, it only included beers, wines, soft drink and tea but as we drink beer and wine it was fine. The entertainment was great and the views whilst cruising up and down the Danube in the dark was amazing. Would defiantly recommend it to anyone wishing to do a evening cruise. Very enjoyable experience. The food was generally tasty although my main dish was not served at the optimal temperature. The service staff was attentive and the entertainment was quite good. Very nice experience!!! Food is high level for a touristic cruise. Really funny and romantic. Tegnap este feleségemmel 5. házassági és 10. ismertségi évfordulónkat ünnepeltük a hajón. A staff kiváló és minőségi munkát végzett, a műsor is remek hangulatot csinált. Azt sajnálom, hogy zömével csak külföldi vendégek veszik igénybe, mert szerintem magyar fizetőképes kereslet is lehetne rá. Az esti Budapesti panoráma szerintünk üti minden más főváros panorámáját. Másoknak is nagyon ajánljuk. Köszönjük a remek, romantikus estét. Köszönjük Silverline, köszönjük STAFF! I would like to organize a very romantic dinner with candles for my fiancee. A nice table with candle and with a nice view on the Danube, lil bit far from the other guests…would it be possible? what cruise would you advice me? I can offer you or Piano Battle Cruise which goes 2 rounds in the center of Budapest, it takes 3 hours. 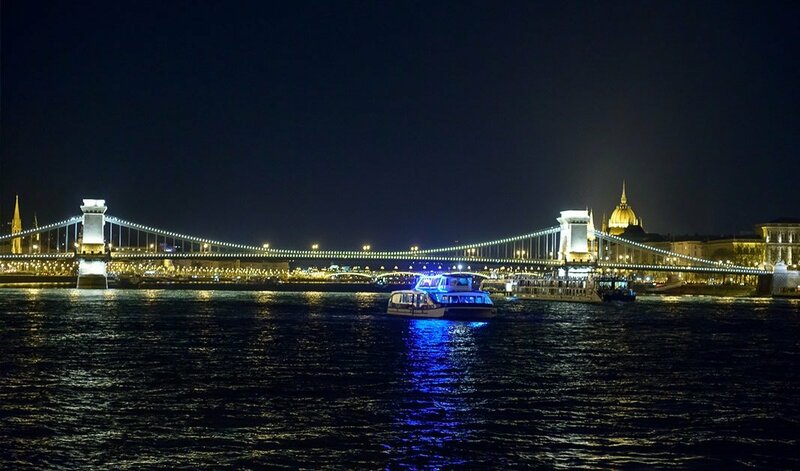 During this cruise you can see the night light’s of Budapest, you will go under the bridges and see the Hungarian Parliament or Buda Castle. You can choose the main course and the soup on the spot when you arrive there. While you have a fantastic dinner you can listen to a great piano show because our musicians plan the whole night to you with a lady’ sing. If you wish to see some picture and read more about it, visit this page and you can book it online. If you need more help, do not hesitate to contact me! Érdekelne ez a romantikus hajós vacsora és zongoraest, de mindketten glutén érzékenyek vagyunk. Mielőtt jegyet vennék szeretnék a menüről érdeklődni, hogy van-e számunkra is megfelelő opció ebben a 4 fogásban. This was the perfect break from a very hot summer day in Budapest. 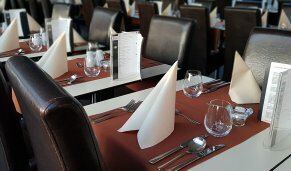 Service is good and the views of sunset on the Danube are superb. The pianists were both extremely talented, and the singer passionate and engaging. I absolutely recommend this cruise! Arról kaphatnék bővebb tájékoztatást, hogy milyen jellegű zenét hallhatunk a zongoraműsor keretein belül? A Zongora Hajós Vacsora programon 3 órán keresztül az örökzöld klasszikusoktól kezdődően, filmzenék betétdalain át, magyar egyvelegek hallhatók élő ének kísérettel! Hey Silverline, since I see I could book window-seat for the Folklore show, I am interested how can I book it for the piano battle show to be sure I get a nice view? láttam az operett és folklór műsornál lehet ablakos asztalt foglalni. A zongorás vacsoránál ezt nem látom. Hogyan tudok ablakos asztalt foglalni zongora estre? A hajónk emeleti részén lévő Zongorás Vacsora Est minden ülőhelye ablak melletti, ezáltal jól látható a Budapesti Panoráma a városnézés során. Amennyiben további kérdése volna, forduljon hozzánk bizalommal! I loved the Folklore show last year, so I would like to try the piano battle this time. How can I get the voucher if I want it to be printed and give it to my parents for Christmas? Az énekesnő is nagyon jó hangulatot varázsolt 5* jár neki is. És mindehez még hozzájárul a kivilágított budapesti látvány. Great Cruise with good food and wievs. Friendly service. Spend an unforgettable evening on our dinner cruise. Cruise along the embankment of River Danube in an elegant environment on our luxurious catamaran. 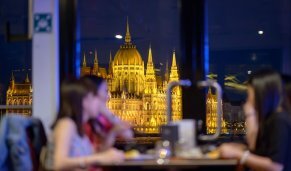 The Budapest dinner cruise gives you the opportunity to marvel at the unique, floodlit panorama, signature bridges and monumental buildings of the capital. Our exceptional piano show makes our cruise an even more captivating experience. The great atmosphere of the event is ensured by two brilliant pianists and a fantastic, charming vocalist. Well known, romantic and entertaining melodies are played throughout the show. Guests are awaited with a glass of welcome drink and are served with a delicious 4-course menu during our Budapest cruise. 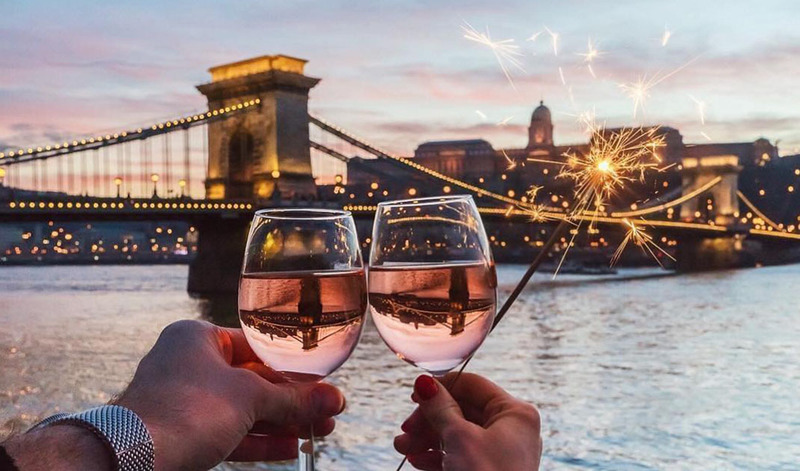 Thanks to the magical lights of Budapest, candlelight, piano show, and the delicious fine dining experience, our dinner cruise is a perfect choice for birthdays, weddings, New Year’s Eve celebrations and Valentine’s Day dates alike. The melody-infused dinner cruise sets sail every day of the week. During winter heating, during summer air conditioning is ensured. The catamaran sets sail from dock nr.11 at 7:30 pm and arrives back to the boarding point at 10:30 pm. Spoil yourself with our Budapest cruise. During the 3-hour long cruise, our dear guests are served a 4-course menu, while they enjoy the view of the capital’s most beautiful places from the Danube. Boarding time starts at 7 p.m. Place of Departure is at dock nr. 11. Jane Haining Rakpart, Budapest, right next to Elisabeth Bridge. We turn our head to North and go against the elements. Chain Bridge and Margaret Bridge can be investigated from another perspective on the way up to North, and Liberty Bridge, Petőfi Bridge, and Rákóczi Bridge on the way down the river. As well as all of the Budapest attractions between the Margaret Bridge and the Rákóczy Bridge just like the Parliament, the Matthias Church, the Buda Castle, and the Gellért Hill. What does the menu include? 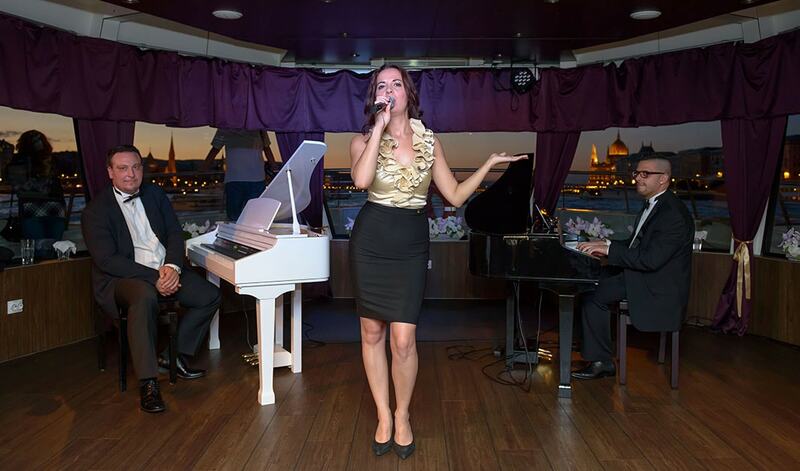 Our 4-course menu offers an exclusive dinner on board which is served during the live piano show. Upon arrival our dear guest are awaited with a glass of welcome drink, to make the comfort zone reach earlier. Piano music starts already during the boarding time, so you won't be bored even if you arrive at the beginning. Right after departure the singer will join the team and introduce the ship and the program of the evening. The only thing you have to do is to enjoy the great atmosphere - right after you have chosen from the menu of course. What kind of delicious specialties do we offer? We like to say, we mix an international taste with the lovely touch of the Hungarian cousin. Even so, you will find something from the menu if you prefer vegetarian food, or you have to take care of your food intolerance. This four-course menu includes a starter what can be a light salad or a little fun from the Hungarian taste. Be interested in and follow the Hungarian culture even if it is a starter, a soup or the main course. Do not leave Hungary without trying the famous goulash soup, the traditional duck meat with cabbage or the unique „pörkölt” with the homemade pasta. You have two different options to consume the beverages our bar offers. We have the classic drink menu where you pay for what you have consumed from the wide selection. We offer Hungarian selected wine, short drinks, and cocktails, hot drinks fruit juices as well, just like a classic bar. If you are looking for something really romantic for your love, a candlelight dinner is always a good choice, whenever you are young or older and love the modern style or prefer classical, romantic pleasures. This dinner won't show the sign of an average, boring evening since the program is a 3 in one opportunity. First of all this dinner includes 4 courses right for all the tastes. Second important is the live music show, that will entertain you the whole evening, and the most important is the fact, that the whole time you will float on the river, between the two riverbanks of the Danube in one of the most romantic capitals in Europa. The illuminated Budapest, the breathtaking attractions during the 3 hours course won't disappoint you for sure. 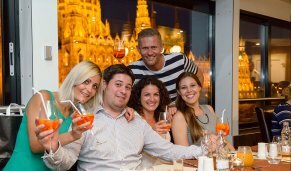 Join us for a great night, join us for ones in a lifetime experience in Budapest and come with us to have a great dinner in the middle of the Danube. If you think this is not romantic enough for you and you are looking this page before Valentine’s Day than we have good news for you: we have special Valentine’s Day program for people who want to celebrate this special day in an exclusive atmosphere. 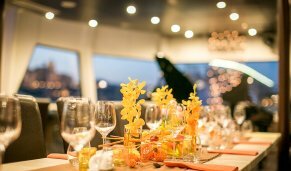 Thousands of satisfied customers have chosen our piano accompanied dinner cruises, their joyful smiles at the end of our journey are what keeps us moving forward.